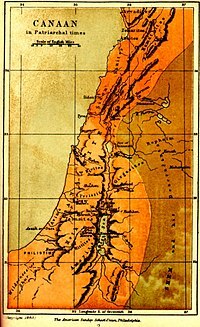 The land of Canaan, which comprises the modern regions of Israel, Palestine, Lebanon, Jordan and Syria. At the time when Canaanite religion was practiced, Canaan was divided into various city-states. Arsay, goddess of the underworld, one of the three daughters of Ba'al Hadad. Ba'al Hadad (lit. master of thunder), god of storms, thunder, lightning and air. King of the gods. Uses the weapons Driver and Chaser in battle. Often referred to as Baalshamin. Eloh Araphel, god of darkness and evil, the eldest son of Mot god of death. Horon, an underworld god, co-ruler of the underworld, twin brother of Melqart, a son of Mot. Bethoron in Israel, takes its name from Horon. Ishat, goddess of fire, wife of Moloch. She was slain by Anat. 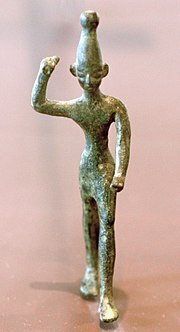 Melqart, "king of the city", god of Tyre, the underworld and cycle of vegetation in Tyre, co-ruler of the underworld, twin brother of Horon and son of Mot. Pidray, goddess of light and lightning, one of the three daughters of Ba'al Hadad. Qadeshtu, lit. "Holy One", putative goddess of love, desire and lust. Also a title of Asherah. Tallay, the goddess of winter, snow, cold and dew, one of the three daughters of Ba'al Hadad. Yarikh, god of the moon and husband of Nikkal, separated husband of Shapash the sun goddess. It is considered virtually impossible to reconstruct a clear picture of Canaanite religious practices. Although child sacrifice was known to surrounding peoples, there is no reference to it in ancient Phoenician or Classical texts. The biblical representation of Canaanite religion is always negative. Archaeological excavations in the last few decades[when?] have unearthed more about the religion of the ancient Canaanites. [page needed] The excavation of the city of Ras Shamra (1928 onwards) and the discovery of its Bronze Age archive of clay-tablet alphabetic cuneiform texts provided a wealth of new information. More recently,[when?] detailed study of the Ugaritic material, of other inscriptions from the Levant and also of the Ebla archive from Tel Mardikh, excavated in 1960 by a joint Italo-Syrian team, have cast more light on the early Canaanite religion. ^ Whereas the Israelites originated as Bronze Age Canaanites, the origin of Yahweh is indeterminate (see Yahweh §Bronze Age origins). Following the introduction of Yahweh (localized to the Iron Age kingdoms of Israel (Samaria) and Judah), a shift in theophoric naming occurred in which the original and most ancient biblical names paying tribute to El (Isra-el, Dani-el, Samu-el, Micha-el etc.) began to be displaced by names paying tribute to Yahweh. ^ Evans, Annette H. M. "Monotheism and Yahweh", The Development of Jewish Ideas of Angels: Egyptian and Hellenistic Connections, ca. 600 BCE to ca. 200 BCE. PhD diss., Stellenbosch University, 2007. p. 291. "Handy (1994:176,177) describes the four hierarchical levels in Syro-Palestinian mythology. The first level consists of the deity El (or his equivalents) and Asherah. The second level consists of the active deities or patron gods, for example Baal, and the third, the artisan gods, for example Kothar-wa-Khasis. The lowest level consists of the messenger-gods, who have no independent volition, which Handy equates with the “angels” of the Bible." ^ "Caananite Religion". www.mc.maricopa.edu. Retrieved 2017-08-09. ^ "Canaanite culture and religion". history-world.org. Retrieved 2017-08-09. ^ "Baal | ancient deity". Encyclopedia Britannica. Retrieved 2017-08-09. ^ Smith, Mark S. (2002). The Early History of God: Yahweh and the Other Deities in Ancient Israel. Wm. B. Eerdmans Publishing. pp. 32f, n. 45. ISBN 978-0-8028-3972-5. [Deuteronomy 32:8-9] suggests that Yahweh, originally a warrior-god from Sinai/Paran/Edom/Teiman, was known separately from El at an early point in early Israel. ^ Botterweck, G.J. ; Ringgren, H.; Fabry, H.J. (2006). Theological Dictionary of the Old Testament. 15. Alban Books Limited. p. 24. ISBN 9780802823397. Retrieved 2014-12-15. ^ "26 Religions". cs.utah.edu. Retrieved 2014-10-01. ^ "MELCHIZEDEK - JewishEncyclopedia.com". jewishencyclopedia.com. Retrieved 2014-10-01. ^ "The Shelby White & Leon Levy Program: Dig Sites, Levant Sothern". fas.harvard.edu. Archived from the original on 2014-03-29. Retrieved 2014-10-01. ^ Bohstrom, Philippe (21 June 2016). "Canaanites Imported Sacrificial Animals From Egypt, Archaeologists Find" – via Haaretz. ^ Bruce C. Birch (1997-01-01). Hosea, Joel, and Amos. Westminster John Knox Press. pp. 33, 56. ^ Davies, Philip R. (1 April 2016). "Early Judaism(s)". On the Origins of Judaism. Routledge. p. 15. ISBN 978-1-134-94502-3. Ancient Israel and Judah were not “communities of faith” as distinct from any of their neighbours, all of whom had their own deities also. We cannot know in much detail what the religions of these ancient societies were, but the books of Judges—Kings and the archaeological evidence agree that much religious practice in these two kingdoms largely conformed to local patterns (“worshipping the Baals”). ^ Thompson, Thomas L. "A view from Copenhagen: Israel and the History of Palestine". The Bible and Interpretation. Mark Elliott, Patricia Landy. Retrieved 15 September 2017. The Bible, I think, is neither historical nor historiographical, but a secondary collection of tradition. ^ Moscati, Sabatino. The Face of the Ancient Orient, 2001. ^ Stories from Ancient Canaan, Second Edition. ISBN 1611641624. Retrieved 9 February 2017. ^ Schaeffer, Claude F. A. (1936). "The Cuneiform Texts of Ras Shamra~Ugarit" (PDF). London: Oxford University Press. Archived from the original (PDF) on 2011-09-20.